DIY Nelson Pass B1 Buffer from the rear shows two selectable inputs and a single output. Compared to the Nelson Pass BoZ the mid range and treble I feel are more transparent but bass weight is less. The sound is completely un-coloured. 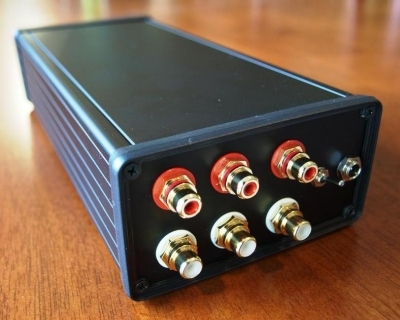 This inexpensive simple preamp has a frequency extension from 5Hz to 780kHz and is very PS tolerant. For more information about this build see the Russian Pass B1 FET Preamp/Buffer thread on the forum.